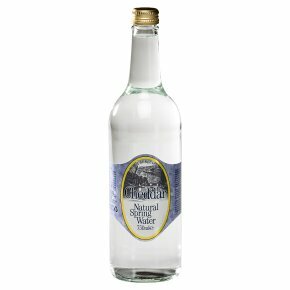 Sparkling natural spring water Water is the forgotten and most important nutrient to our bodies, which consist of 66% water. An average person loses 2 1/2 litres per day. Nutritionists recommend we drink 2 litres of water daily. 2 litres of Cheddar Spring Water can provide 33% of your daily requirement of calcium. It also contains many other essential minerals contributing towards our daily allowance. Water is the most effective natural remover of toxic substances from our bodies.